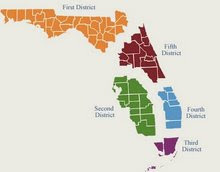 In Ecoventure WGV, Ltd. v. Saint Johns (5D10-542), the Fifth District addressed "whether section 720.3085, Florida Statutes (2007), may be applied to impose joint and several liability on it for the unpaid homeowner's association assessments incurred by its mortgagor." After Ecoventure foreclosed on a mortgage, the association sought to impose back assessment incurred by the prior owner on Ecoventure. The trial court rejected Ecoventure's argument that imposing liability was a retroactive application of the statute because liability only attached for unpaid assessments that were due at the time title was transferred and Ecoventure obtained title after the statute's effective date. The trial court also found that applying the statute did not impair Ecoventure's rights under its mortgage with DMHB because the statute permitted it to seek recovery from DMHB of any amounts it paid. When Ecoventure extended its mortgage to DMHB in 2001, its rights under the Declaration vested. Imposing section 720.3085, which was enacted after the mortgage was extended, completely alters Ecoventure's vested rights by making it jointly and severally liable with the "previous parcel owner for all unpaid assessments that came due up to the time of transfer of title." § 720.3085(2). The court in Coral Lakes Community Association, Inc. v. Busey Bank, N.A., 30 So. 3d 579, 584 (Fla. 2d DCA 2010), recently addressed the very issue raised in this appeal and concluded the enactment of "section 720.3085 cannot disturb that prior, established contractual relationship." We likewise agree that imposing the statute on Ecoventure "would operate to severely, permanently, and immediately change the parties' economic relationship . . . a circumstance not supportable under the law.